Chapter 1. Introduction. Chapter 2. Air as an Object of Analysis. Atmospheric air and sources of atmospheric pollution. General characteristics of air pollutants. Specific features of air as an object of analysis. Chapter 3. 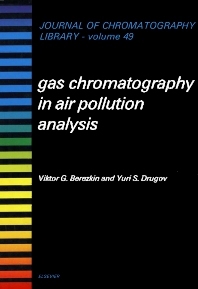 Gas Chromatography in the Analysis of Air Pollutants. General considerations. Peculiarities of the gas chromatographic analysis of impurities. Chapter 4. Detectors for the Gas Chromatographic Determination of Impurities. Principal characteristics of detectors for gas chromatography. Flame ionization detector. Thermionic detector. Photoionization detector. Electron-capture detector. Flame photometric detector. The thermal energy analyser (TEA) detector. Detectors for direct identification of impurities. Hall electrolitic detector. Chapter 5. Collection and Pretreatment of Samples for Chromatographic Analysis. Sampling into containers. Use of absorption of contaminants in sample collection. Cryogenic concentration of contaminants. Use of adsorption for contaminant concentration. Multilayer sorption traps. Sorbents for passive sampling. Chemisorbents. Trapping of solid particles and aerosols. Preparation of concentration tubes containing solid sorbent. Influence of sampling conditions on the efficiency of sorption of pollutants. Desorption of pollutants from the sorbent. Influence of experimental conditions on the completeness of recovery of pollutants. Increase in desorption efficiency. Choice of sampling methods. Metrological aspects of air pollutant determination by gas chromatography. Chapter 6. The Reactive-Sorption Method and its Application for Concentrating Pollutants. Concentration of pollutants on solid adsorbents. Reactive-sorption concentration. Use of the reactive-sorption method to enhance the reliability of the determination of pollutants. Diminution of coadsorption of pollutants. Improvement of chromatographic separation. Moisture removal. Identification of pollutants. Conclusions. Chapter 7. Quantitative Methods for the Determination of Impurities. Preparation of standard mixtures. Detector calibration. Calculation of impurity concentrations. Detection limits for air contaminants. Chapter 8. Practical Application of Gas Chromatography to the Determination of Air Pollutants. Carbon oxides. Halides and their derivatives. Nitrogen-containing compounds. Sulphur- and phosphorus-containing compounds. Metals and their derivatives. Low-boiling hydrocarbons. Aromatic hydrocarbons. Polyaromatic compounds. Organic oxy compounds. Amines and nitro compounds. Odorants. Halogenated hydrocarbons. Freons. Chlorine-containing pesticides, polychlorobiphenyls and dioxins. Bis(chloromethyl) ether. Vinyl chloride. Conclusion. Each chapter contains References. Air pollution determination is one of the most important fields of gas chromatography application in practice. This book provides a systematic description of the main stages of air pollution determination, ranging from sampling problems to the quantitative estimation of the acquired data. Special attention is paid to the problem of gas, vapor, spray and solid particles extraction from air. The main methods of sampling procedure, namely, container utilization, cryogenic concentration, absorption, adsorption, chemisorption and filter usage, and successive impurities extraction are also handled. Sorption theory and the problems of sorption and desorption efficiency for hazardous impurities being extracted from traps with sorbents are discussed in detail. The practical utilization of different sorbents (silica, activated carbon, polymers etc.) to carry out sampling procedures for 200 main pollutants with known TLV (USSR and USA) is also considered. This highly informative book, reflecting several insufficiently known techniques as well as the experience of both western and Soviet researchers, should be of interest to both beginners and skilled researchers.